Dr. Fuddle and the Gold Baton by Warren L. Woodruff is an unique musical fantasy children's novel. The book follows the adventure of five kids getting back the Gold Baton and saving the mythical land of Orphea. Each of the kids have a unique personality and the plot features them each having strengths and weaknesses and highlights them working together to succeed. The classical music nature of the novel may make this a boring read for some, but for those interested in music and/or learning more about music this is an interesting read. Throughout the book there are references to musical terms and in Orphea music is basically magical and can do all sorts of things. The inclusion of historical figures involved in making, playing, and supporting music also makes it a good read for those interested in music history. 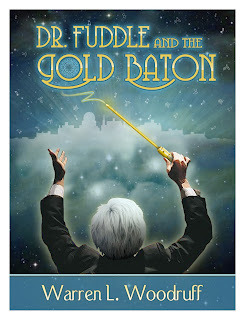 While the descriptions of the music can sometimes slow the plot down too much, overall the flow of Dr. Fuddle and the Gold Baton is steady with great peaks for the final battle and ending. The main strength of the book is the unique personalities of the kids making it easy for many different people to relate to at least one of the main characters. For example, there is a scientific skeptical boy, a fashion conscious girl, a boy overcoming fears, a boy tempted by the cool kids/wrong crowd, and a mute girl.